Hey Hey Ape Fans! Welcome back to Talking Apes TV! We kick off this episode by looking at some awesome costume cross-overs from Star Wars Celebration Europe. These have got to be the best we’ve ever seen – Planet of the Star Wars! 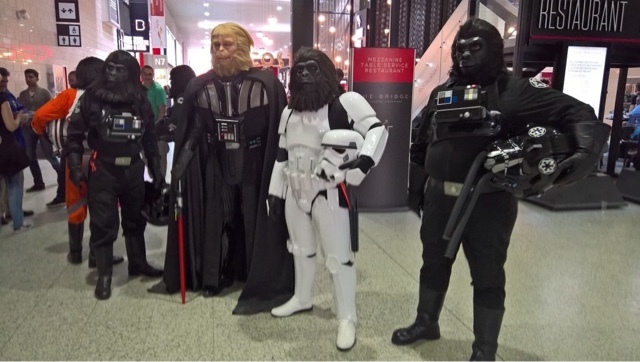 Fans dressed as vintage Apes wearing Stormtrooper, X-Wing and TIE Fighter pilot uniforms. All lead by Darth Zaius. Speaking of crossovers, Boom Comics who mashed-up Star Trek and Planet of the Apes is at it again with – Tarzan on the Planet of the Apes! We review the details as given at time of recording for this 5 issue mini-series. When war between man and ape breaks out, which side will Caesar and his brother Tarzan choose? First issue to be released 9/28/2016. Bill, Jeff and Judy have to get the humanoids away from their home before Urko’s imminent attack. They build rafts and sail away to their new home in New Valley (as foretold in Tunnel of Fear). Meanwhile in Ape City, Dr. Zaius visits Cornelius and Zira to thank them for stealing Urko’s plane (as seen in last episode ‘Screaming Wings’). By doing so, Zaius feels that Zira and Cornelious have saved simian society from Urko’s dictatorship. Hungry for power, Urko has tracked the humans to their new home and plans to destroy them once and for all! We have a blast reviewing this episode since we are starting to see the bigger story. They better hurry up since there are only 4 more episodes to the series! It’s always a bonus when the writers think about continuity and include Easter eggs from the films and live-action TV show. And we see Urko spiraling further into insanity! Listen, have fun, and Go APE!